The .25 ACP (Automatic Colt Pistol) is a straight-walled, semi-rimmed, centerfire cartridge designed by John Browning in 1905. The ammo was released along with the Fabrique Nationale M1905 pistol. 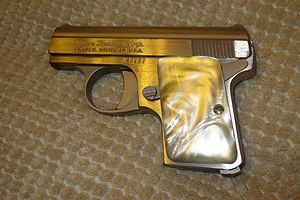 Introduced in Belgium in 1906, the Fabrique Nationale is a vest pocket pistol intended for use by gentlemen of the era. The 25 caliber ammo came to the U.S. in 1908 alongside the Colt Model 1908 Vest Pocket. Often referred to as .25 Auto, .25 ACP ammo measures 6.35 x 16mmSR. It features a 50-grain bullet that feeds into the chamber through a removable magazine. The projectile is .251 inch, has a rim diameter of .302 inch, and a .043 inch rim thickness. The case is .615 inch with the full cartridge measuring .91 inch. While a .25 caliber ammo is a low power cartridge, it has an average penetration of 7-11 inches. Estimates say that with proper placement, 25% of .25 ACP rounds can incapacitate a threat. Despite Cooper’s comments, many people continue to choose .25 caliber weapons for self-defense. In the early 1900s, vest or “belly pistols” were popular among civilians. The lure was that they were easy to conceal and ideal for self-defense. People don’t take the pistols seriously due to low power and lack of penetration. Some called them “mouse guns.” Despite their inadequate performance except at close distances, many small handguns are modeled after this style. Because of the round’s small size, the guns chambered for .25 caliber ammo are smaller than a man’s hand. Although it’s small, it addresses several common problems that face other small caliber bullets. The .22 Short, .22 Long, .22 LR, and .17 HMR have experienced reliability problems due to the rimfire design. The .25 ACP is more reliable because it used centerfire primer. An additional improvement is the use of hollow point bullets, which improves on the stopping ability of the round. Experts often discount the .25 caliber ammo as being insufficient for self-defense. The ammo accomplished the job as long as there is proper placement. The important thing is stopping the threat. Full metal jacket (FMJ): FMJ is the most common .25 Auto ammo found on the market. It’s ideal for training and target shooting. It is not well-suited to self-defense. Jacketed hollow point (JHP): The JHP bullet narrows to a lead center. The bullet expands on impact. This creates a higher level of damage and improves stopping power. JHP is the most popular type of self-defense .25 ACP ammo. Gold Dot hollow point (GDHP): Gold Dot designed the GDHP for self-defense purposes. It is a hollow point round with a pre-fluted core with fault lines to control the bullet’s expansion. Hornady Extreme terminal performance (XTP): Hornady designed XTP bullets for self-defense. The basic JHP contains serrations to divide the round’s outer cover into equal parts. These serrations allow for controlled expansion, despite the cartridge’s low velocity. Modern handguns are more effective than the .25 ACP which was part of the ammo’s decline. However, there are European companies that still manufacture the weapons. Companies manufacturing guns chambered for the .25 caliber ammo include Ruby, Sig Sauer, HK, Raven, Bauer, Taurus, Phoenix Arms, Sterling, and Kel-Tec. Buyers in search of vintage or antique arms can find weapons manufactured in Italy, Germany, Belgium, and the former Soviet Union.